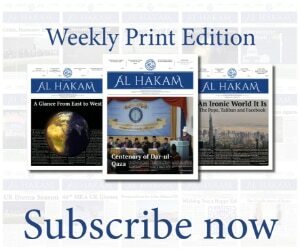 By the blessings and benevolence of Allah the Almighty, the 21st volume of Al Hakam begins with the current issue. It would have been the 23rd volume of Al Hakam if there were less hurdles and hardships in its publishing. All praise be to Allah that in the previous year, Al Hakam continued to publish on standard paper with regularity. Its publishing stopped during the outbreak of influenza, but it was not specific to Al Hakam; many papers were affected by this outbreak. Al Hakam’s success resulted from the monetary funds and consideration of its associates. I am really thankful to those sincere individuals who paid heed to keep this souvenir of the profound era of the Promised Messiahas alive. I solemnly believe that they will excel in their support and regard this year as well, so that I will be able to publish Al Hakam as an up-to-date weekly issue. Lastly, everything is dependent on the blessings of Allah the Almighty, so we pray to Him that He grants me and the associates of Al Hakam strength, so that unitedly, through our courage and power, we are able to keep this souvenir of the era of the Promised Messiahas alive. The coming year gives us a sign that we are a year closer to death. However, it is a welcoming sign and a meaningful thing if the signal of approaching death awakens us because an awareness of death can serve as a lesson for man to prepare for eternal happiness. There is no need to revise the whole story of the happenings of the previous year. The concluding days of the previous year were a means of spiritual stimulation and awakening for the Jamaat carried out by the angels. Due to the outbreak of influenza, many intellectual and optimistic youngsters parted us, while many courageous and farsighted elders left us. We are broken-hearted and grief-stricken at their demises, but we are content with the will of Allah the Almighty. As this is God’s Jamaat, He Himself is its guardian and helper. It is not dependent on any person. The health of Hazrat Khalifatul Masih II, may Allah strengthen his hand, declined in the previous year and, at times, it so happened that there was a question of life and death! Owing to the circumstances, Hazrat Khalifatul Masih had to write a will regarding the management and establishment of the Jamaat. By the blessings and benevolence of Allah the Almighty, the health of Hazrat Khalifatul Masih is improving since the concluding days of the previous year and the new year has dawned upon us with high hopes. By the grace of God, the blood-stained climate of the world is being purified. The clouds of bloodshed, killings and the desire for power are disappearing from the horizon of politics. The first dawn of this new year has emerged as a fortunate and peaceful beginning. All praise belongs to Allah who made it happen. Qadian presents a picture of the sacred land (Mecca) in the last week of December, but this year, Jalsa Salana was postponed due to the Easter holidays. Yet still, many people visited Qadian and Hazrat Khalifatul Masih delivered an important address on the morning of 28 December and gave a Dars-ul-Quran (in-depth explanation of verses of the Holy Quran) on 29 December. Immediately after the beginning of the new year, a scheme of Hazrat Khalifatul Masih was put into practice regarding the management of Jamaat. Hazrat Khalifatul Masih II stated that the Jamaat was progressing by the grace and mercy of Allah the Almighty and its works were expanding as well. So, to fulfill the requirements of the Jamaat, a number of individuals were appointed for different works of the Jamaat and their duty was to perform their assigned tasks with responsibility. The head of the new body of administration was given the title Nazir-e-Ala (Chief Administrator). A Nazir Talif-o-Ishaat (Director of Compilation and Publication) was appointed to look after the works of propagation and Jamaat’s publications. A Nazir Talim-o-Tarbiyat (Director of Education and Edification) was appointed to look after both the religious and worldly education and edification of Jamaat’s individuals. A Nazir Umur-e-Ama (Director of General Affairs) was appointed to look for different ways whereby the Jamaat can progress and to provide assistance to the government whenever necessary. Moreover, he was to motivate the youngsters of Jamaat to opt for those professions which were helpful for both the religious and worldly progress of Jamaat. A Nazir Bait-ul-Mal (Director of Finance) was appointed to manage the collection of Zakat, alms and to look after the accounts, as well as to ponder on fulfilling the financial needs of the Jamaat.